Report Condemns Australian Prison For Forcing Woman To Give Birth Alone In Cell "I wanted to understand how such a distressing, degrading and high-risk set of events could have occurred in a 21st Century Australian prison," the head of a prison watchdog said on Wednesday. 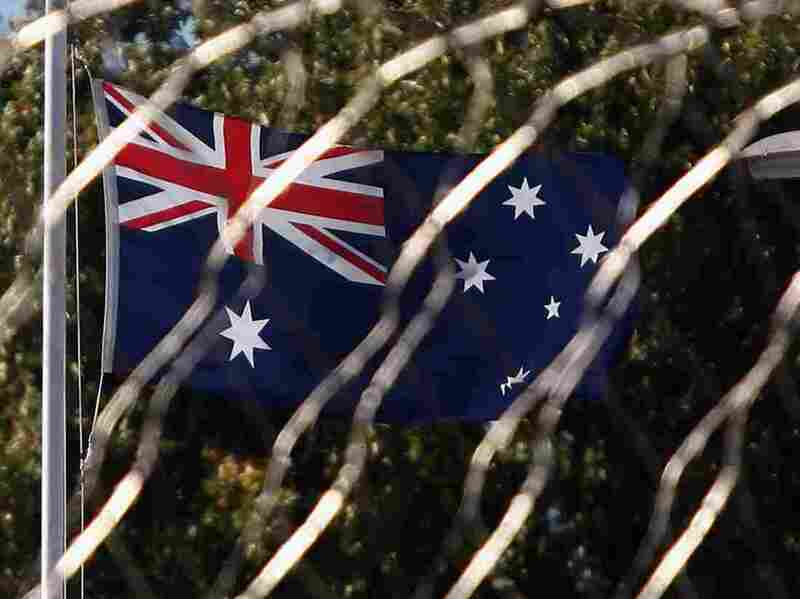 An Australian flag flies outside Bandyup Women's Prison where a woman was forced to give birth alone in a locked prison cell despite pleading for help for more than an hour, according to a newly released report. Sometime around 6:30 p.m. on March 11, a pregnant woman locked in an Australian maximum security prison cell began crying out for help. For more than an hour she wailed in pain, pleading for someone to intervene. She was 36 weeks pregnant and the child was about four weeks too early. Her anguish eventually drew custodial staff and, at approximately 7:35 p.m., some nursing staff, who attempted to comfort her through a gap in the cell door. However, without keys all they could offer were words, not the physical support she required. Then, at about 7:40 p.m., without a doctor or pain relief, the woman gave birth alone in the cramped cell at Bandyup Women's Prison. Even after the baby was born it took somewhere between seven and 12 minutes for the one person with a key to the cell to arrive and unlock the door. It was then that the woman, identified only as Amy in official documents, was transferred to a hospital. Those are the findings of a blistering report by a prison watchdog of Australia's Department of Justice released on Wednesday. The report didn't say why Amy was incarcerated. The probe, led by Neil Morgan, Inspector of Custodial Services, set out to uncover "what [the department] is doing to improve its practices, to mitigate the risks to pregnant women and their unborn and newly born children." "I wanted to understand how such a distressing, degrading and high risk set of events could have occurred in a 21st Century Australian prison," Morgan said. The answer, he eventually concluded, was that "cascading and intersecting failures put Amy, her unborn child, and her newborn baby at high risk." Staff were slow to act even though they knew she was in the late stages of pregnancy. "We listened to recordings of numerous cell calls in which her pain and distress were obvious," Morgan noted, yet it took a guard about an hour and 22 minutes to arrive with a key. He also said it was "inexcusable" that Amy was deprived of having medical staff with her during the birth, "and that it was only after her child was born that staff called a 'Code Red' emergency." Poor communication between the staff as well as a staff shift change seemed to take priority over caring for Amy, according to the report. Additionally, staff violated established record-keeping orders. They did not log cell calls from Amy or other distressed women, making it impossible to confirm how long it took to open the locked cell. "Finally, the prison downplayed the seriousness of the events when reporting to head office. It is not clear if this was because staff had become desensitised to risk and duty of care, or it it was an attempt to mislead," Morgan said in a statement. Morgan's recommendations for the department include an expansion of adequate infrastructure for women in late stages of pregnancy, including medical and nursery facilities. According to the probe, in 2009 the corrections department received over $600 million (about $545 million U.S.) for new prison accommodation, but despite rising numbers of female prisoners, nearly all of the money went to men's facilities. The Australian news outlet ABC reported, "[Western Australia's] Corrective Services Commissioner Tony Hassall apologised for failing Amy and her baby." Hassall also accepted the Morgan's findings and said the state had already moved to change practices within its correctional system. "There were a catalogue of errors, the staff having access to the keys, to some of our procedures locally, to staff training available — right going back to the transfer of Amy to one prison to the other," Hassall said. Carolyn Sufrin, a medical anthropologist and OB-GYN at Johns Hopkins School of Medicine, told NPR's All Things Considered it creates unnecessary health risks for the mother and child. "When taken off-site all incarcerated persons are presumed to be dangerous and a potential flight risk," Sufrin explained. "A pregnant person needs to be taken off-site for medical attention and for childbirth" and is therefore placed in shackles throughout the painful and sometimes, perilous process of childbirth. "I just gave birth six months ago and I can tell you that the thought of running off and escaping and outrunning anybody else is just ludicrous to me," she said. On Tuesday, Senate Majority Leader Mitch McConnell announced the Senate would take up The First Step Act, this month. "This bill would only pertain to women incarcerated in federal facilities and under the jurisdiction of the U.S. Marshals Service, so it would not pertain to people incarcerated in state prisons, which is where the majority of women are incarcerated. It would also not pertain to women housed in local jails. And on top of that, it only addresses the issue of shackling pregnant women. That is an important step to take, but it is only the tip of the iceberg when it comes to the care of pregnant and postpartum women in custody."